I am applying for AIEEAUG. I am appearing in Class XII (Qualifying exam). My result is not yet declared. I don’t have any percentage to fill in the columns asking for percentage. What should I do? Leave blank, if appearing / result not declared. What is Online Application Process for AIEEA 2016? Where can I get the necessary information about AIEEA and AICESRF (PGS)2016? Information Bulletins for AIEEAUG, PG and AICESRF (PGS) 2016 are available on ICAR website: www.icar.org.in .Candidates are advised to read the Information Bulletin (AIEEAUG / PG / AICESRF (PGS) 2016) critically before filling the Online Application Form. 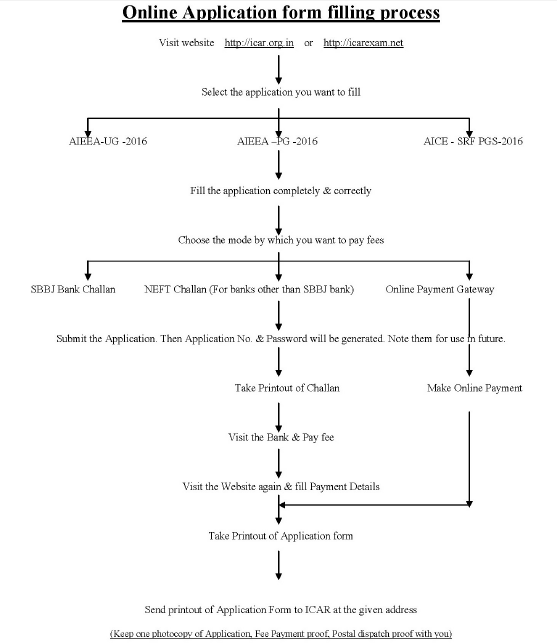 What should I do after taking printout of my SBBJ bank Challan / NEFT Challan? You should visit your nearest SBBJ bank branch and deposit the amount printed on the Challan. Bank will return you two parts of challan duly stamped. After depositing the amount, you are required to visit the ICAR website again. Login using your application no. and password and upload the payment details on the website. Ensure that only correct details are entered, as incorrect details shall lead to rejection of the application. After uploading the payment details you will be able to take printout of your application. Lastly, keep Candidate copy of challan with you and attach the ICAR copy along with the printed form. Then send it to ICAR as explained in next answer. During online filling of the form, candidate can also opt for making fee payment through Credit card / Debit card using Payment Gateway of Canara Bank. In this case the candidate will make payment directly through his / her computer and will not be required to visit the bank. Receipt of such payments/application is confirmed immediately. NEFT Challan should be used for making payment from any scheduled Bank other than SBBJ bank. You can take a print out of NEFT Challan and send NEFT remittance through any branch of any Scheduled Bank. You must obtain the UTR number from the Bank through which you have sent NEFT remittance. After obtaining the UTR number, you are required to visit the ICAR website again. Login using your application no. and password and upload the payment details on the website. You are requested to ensure that only correct details are entered, as incorrect details shall lead to rejection of the application. After uploading the payment details you will be able to take printout of your application. Lastly keep Candidate copy of challan with you and attach the ICAR copy along with the printed application form. Then send it to ICAR as explained in next answer. What type of records I should keep with me after submitting application? I have filled and sent my application to ICAR. But now I want to Add / Edit some details in my application. What should I do? Online Reporting of Correction (For editing application) will be available only once. This facility will be available throughout i.e. 18.04.2016 to 30.04.2016. I want to apply for AIEEAPG 2016 / AICESRF (PGS) 2016. My final semester OGPA is not yet declared. Am I eligible to apply / appear in the examination? AIEEA PG 2016 : Please refer Item 9.1 (iii) (c) of AIEEA PG 2016 Information Bulletin in this regard. AICE SRF (PGS) 2016 : Please refer to Item 12.1 (iii) (d) of AICE SRF (PGS) 2016 Information Bulletin in this regard. I have completely filled and submitted the Online Application form. What should I do now? Fee amount has been deducted from my account but I am unable to get printout of my application form? Although in Online Payment mode, the payment is reconciled immediately. If due to some Technical problem your payment is not reconciled then it may be updated in next 24 hours. Still if it is not reconciled then you should call the help line. In case you have made Double Payment then your payment will be refunded as per “Refund / Cancellation Policy”. I have updated my correction by “EDIT APPLICATION” option but the print copy of application is showing the same mistakes. As per rules the application form should be edited only once so what shall I do? It takes 2 – 3 days for updation of correction. Still if you want to send your application instantly then you can attach the “ONLINE CORRECTION APPLICATION”. After one time editing, you should take the print out of this “ONLINE CORRECTION APPLICATION” which contains the corrections done by you.